The Virtua Stick Pro is an arcade stick peripheral for the Sega Saturn. It can be seen as an "upgrade" to the regular Virtua Stick (second version), having the same aesthetics and shape but being twice as long to accommodate a second player. It was only sold in Japan. 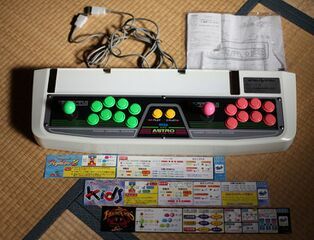 The stick is designed to resemble the arcade panel of Sega's popular (and still widely in use) arcade machines. In a move unusual for the era, the HSS-0130 used two Seimitsu LS-32 Joysticks. Popular for shooting games, these sticks were frequently used in the Astro City arcade machines that the Virtua Stick Pro is based on. Unfortunately, the HSS-0130 does not contain arcade-grade buttons. Instead, snap-in copies directly touch a printed circuit board below. These sticks accept modification easily, and without too much trouble the buttons can be replaced with popular arcade quality snap-ins. Due to the metal tabs that hold snap ins in place, some cutting is required to fit screw-in buttons. In fact, the entire upper metal plate of this stick is removable, and a full actual arcade plate can be installed; even the Virtua On panel will fit. Buyers of these sticks today are cautioned to check the included metal plate for rust; a very common sight on this item when used heavily. The base plastic is quite rugged, and the lower metal plate can be removed for easy modifications. Those looking to purchase a stick sight unseen should be aware that many are now yellowed with age; this is common if the stick is used in a smoking household. The Virtua Stick Pro also features an arcade-sized field at the top for installation of move-lists. Any list that fits on an Astro City or Blast City cabinet will fit. Unlike the original cabinets, this field is not removable and is made of plexi-glass instead of actual glass. When new, move-lists for Virtua Fighter 2, VF Kids, and FIghting Vipers were included. Main article: Virtua Stick Pro/Magazine articles.